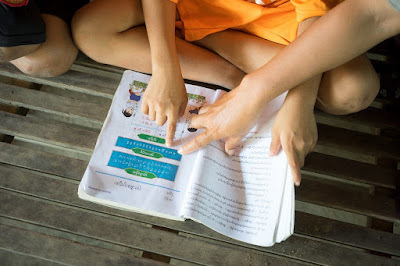 Children are being helped by a social worker to study their text books. The children used to live in residential care institutions (orphanages) but now live with a foster family in Battambang province who are providing them with loving care and support, through a community-based alternative care initiative. The family is supported by NGO social worker through regular visits. Volunteering abroad is a great opportunity to help others and gain experience. Yet, many are unaware that some forms of volunteering, especially in the form of voluntourism, can negatively impact children and families. In the context of vulnerable children, this issue is even greater. To help you make a positive impact for communities through volunteering, here’s a list of ways to ensure that you are volunteering responsibly. Volunteering in a position where you have previous experience and knowledge is important to making a positive difference. While trying something new, like working with children, is exciting, it can be damaging. It takes time and resources to train new volunteers. Without the proper know-how, it is difficult to do quality work. While it is tempting to work with children, unless you are a trained teacher, social worker, or medical professional, do not work directly with children. The rapid turnover of short-term volunteers with little experience hurts childhood development. Children and adolescents need stability, and volunteers coming and going can hinder their development. Short-term volunteering also hinders education, as it is difficult to track the child’s progress and needs. Instead, volunteer in a field where you have experience. You will make a much greater difference by doing something you know how to do. Alternatively, you can commit to gaining the proper skills and qualifications in the area you are interested in before volunteering. Research the organization and know what they have accomplished. You should read any news you can find about them, and ask to contact a former volunteer and talk to them about their experience. Make sure you choose a reputable organization and do not be afraid to be critical. Understanding all sides of the cause you are taking on is also critical. Unfortunately, there are many organizations posing as charities that readily accept volunteers and visitors for a fee. Orphanages operating as businesses is one example. Children are exploited and neglected in the process, and are even exposed to risks of sexual abuse and violence. Supporting such institutions perpetuates exploitation. Rather than volunteering at an orphanage, find organizations working to provide social support to vulnerable children and families. What kind of credentials did the organization ask for, a CV, background check, and legal records, or nothing? Illegitimate institutions, including some orphanages, do not check who is volunteering there. This often exposes children to exploitation and abuse. Consequently, even if you are credentialed to work with children, it is important to avoid these organizations. By volunteering there, you are helping an abusive, scarring, and vicious cycle thrive. Longer-term volunteering is always preferred. Short-term volunteering can drain resources, as it takes time to adjust to the tasks at hand and build relationships in the community. However, volunteering is important and not everyone can afford to dedicate a year of their lives. When volunteering, it is generally recommended to commit a minimum of three months. In this time span, you can develop the necessary skills and understanding you need to positively impact the community, as well as yourself. Be cautious of organization charging fees to receive volunteers, as they will tend to be more focused on generating income than accepting longer-term, skilled volunteers to positively impact communities. In Cambodia, it has been observed that some orphanages receive volunteers for a fee. To keep the money flowing, they must keep children in. This has resulted in the active recruitment of children from the communities to be placed in institutions, especially the most vulnerable. This practice has resulted in 80 per cent of Cambodian children living in residential care institutions having at least one parent that could take care of them with the proper support. Volunteering is the perfect opportunity to help others while building your resume, seeing a new culture, and gaining valuable experiences in the process. However, it is important to remember the primary reason that you are volunteering: to help others. Follow these steps, and do your best to ensure that you are taking up the right cause, not contributing to the problem. The right opportunity to help is out there!